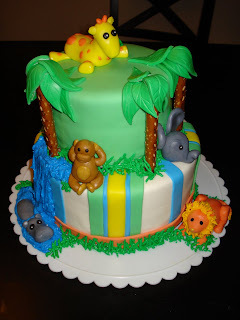 This Jungle Theme Baby Shower cake was made with marshmallow fondant. The top layer was chocolate devils food cake and the bottom tier was a homemade almond white cake. 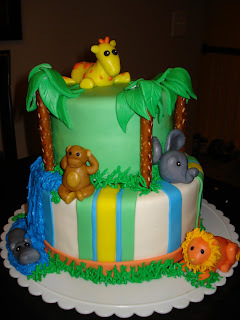 Everything was edible including all the jungle animals which were handmade by my husband and I. The palm trees were created out of pretzel sticks and fondant leaves! This cake was definitely a fun cake to create!